This is a review of the Rajasthan International Folk Festival in Jodhpur, India. As the sun sets, the daunting walls of the Mehrangarh fort in Jodhpur drop their valiant stance, the soft lighting of the monument brings out the intricate designs of the structure whilst the tiles glisten like jewels. Once a year, on a full moon night, Mehrangarh puts on its evening best and warmly welcomes audiences for an experience of pure musical joy. India’s Rajasthan International Folk Festival (RIFF) features a series of folk music traditions from local communities in Rajasthan and around the world, an experience best defined by the cliché: Music is a universal language. Music maestros, barely known beyond their small communities in Rajasthan’s villages, and superstar performers like Manu Chao come together to transcend language and converse in rhythmic sounds. 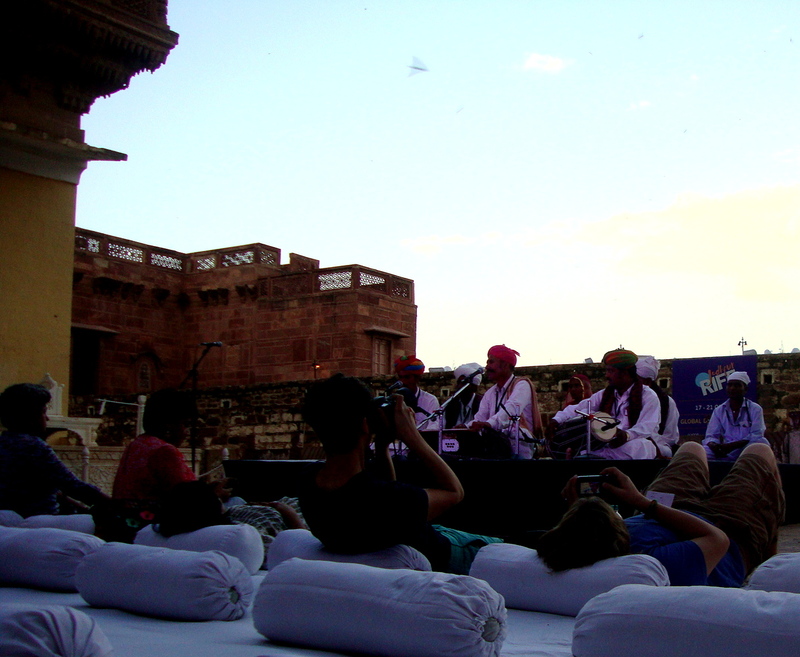 The audience is equally diverse with people from India, France, Spain, Germany, UK, USA, Israel….whilst not sharing a common language with the other, they find a way to bond in the beauty of music and the moonlit Mehrangarh Fort. Over the four days in the melting pot of musical traditions, one thing stands out: When the music is on, we are one. This year, was the eighth annual Rajasthan International Folk Festival. Supported by organisations that promote heritage such as the Mehrangarh Museum Trust, Jaipur Virasat Foundation and endorsed by UNESCO, the aim of the music festival is to showcase local music traditions alongside international folk music ‘bigwigs’. The venue helps in this endeavour of course. Rajasthan is one of the most popular states for tourism in India and the Mehrangarh fort, named “Asia’s Best Fortress” by Time magazine, is a tourist’s delight for soaking in the ethnic culture. The festival gets more than 3000 visitors from all parts of the world. But RIFF attendees are more than just tourists – a British family back at RIFF for the 7th (!) time, a French radio journalist transmitting the voice of Maya Kamati back to her fans in France, a group of middle-aged Indian women on an all-girl vacation, even Master Chef Australia’s Gary Mehigan with his family – you never know who you’ll meet at RIFF! 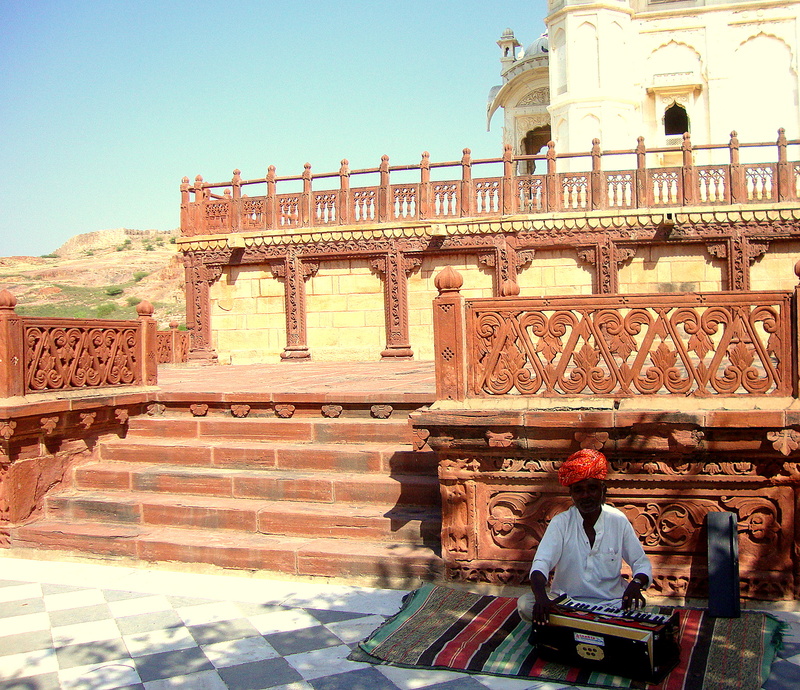 A Rajasthani musician playing the harmonium, an instrument originated from Europe and now an essential part of various Indian music styles. Reflecting upon the diversity of the audience, is the diversity of the performers. Maya Kamati: singer from Réunion, with ancestral roots in India, sings in Maloya, French and Creole. Manu Chao a Spanish-French performer, sings in French, Spanish, Italian, Galician, Portuguese, Arabic and counting. Dode Khan Fakir: an 80-year old algoza (double-flute) player from a musicians’ community in Rajasthan with the lung power of an athlete. Despite this extreme diversity, RIFF picks up a common string among all – a superior musical talent. Instruments become the vocal chords, their sounds become words and music becomes the language. Together they facilitate conversations in the form of songs. No band sang in English, the one language that was common to most of the audience. Yet, no band had a problem communicating. Through beats and strums and harmonies, the language of music was understood by all. Emotions of love, joy, pain and desire found an expression without words. Conversations flowed back and forth in the form of songs and applause. In a moment at RIFF you become aware of the wondrous ability of human beings to have conversations through music, leaving aside words and languages that form the basis of modern-day communication. Observing the mosaic of cultures under the moonlit sky, you eventually find a pattern – everyone has a desire for a veiled expression of emotion; for conveying and concealing feelings at the same time. Music is the outlet for that complex communication. As I exit the surreal experience after three days, the sounds and sights of the festival don’t leave easily. Describing the experience later, I find myself either scrambling for words or rambling on. I remember that at one moment in the festival time stood still, I stood staring at a silhouette in front of me and every emotion burst like fireworks inside me. It was the climax: SIR MICK JAGGER WAS IN THE AUDIENCE WITH ME! 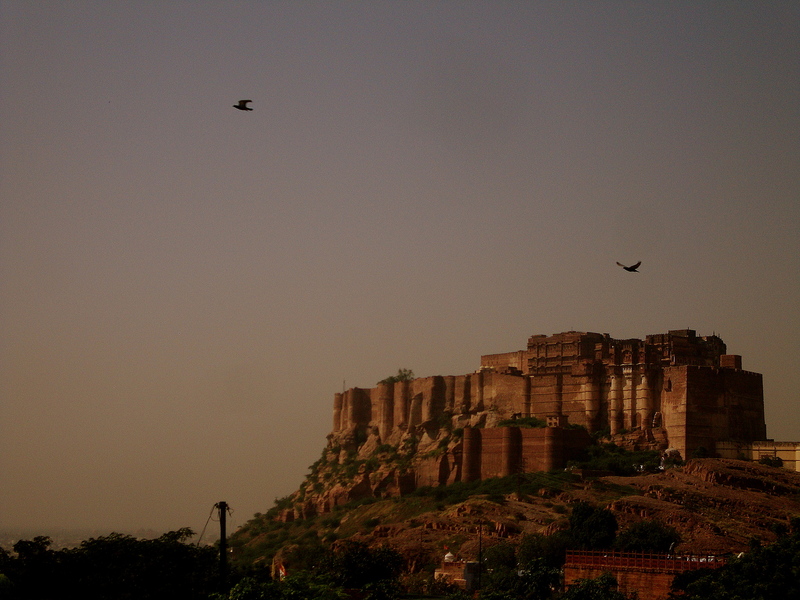 A distant view of the Mehrangarh fort at dusk. 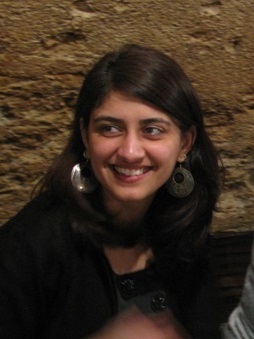 Aditi is from India and studied MA Euroculture in Göttingen and Olomouc. She has worked as a journalist in India and in the online communities team for a human rights organization in London. She’s currently working in public diplomacy at the U.S. Consulate in Mumbai, India. She enjoys travelling, film and music. By reading this all get excited to go to the Jodhpur and attend this exciting festival…And yes also It is also true that the music cannot be just be expressed by the singing only….It can be sung without the words also….you said very well!!!!! !